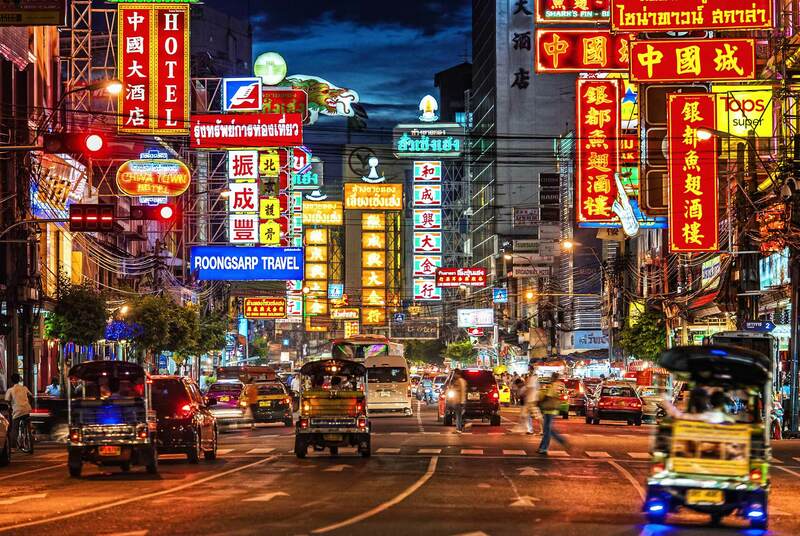 Chinatown is one of the oldest areas of Bangkok. Like many Chinatowns around the world, it’s a hive of commerce, food and activity. As a result it can be crowded, hot and a little dirty. So for those of you who’ve spent hours doing your face or who like to stay cool, calm and collected, I’d avoid at all costs. However for those of you who get off on overstimulation (!?!) or like to get down and dirty, it’s well worth a visit. I’d suggest you go later in the afternoon when the temperature begins to cool and the nighttime street restaurants open – this way you can appreciate both the markets and the great food on offer. My favorite way to penetrate the bowels of Chinatown (am I allowed to say that?) is to take the Chao Phraya ferry boat to Pra Kret pier and go from there. Alternatively you can take the MRT to Hua Lamphong and amble over. I like to simply wander and get lost in Chinatown in the alleys between the River and Charoen Krung Road. I’d say follow your nose, although there are some quite unpleasant smells so not always a great idea. On my last trip to Chinatown, we took the Chao Praya boat to Pra Kret and headed straight into the markets. You’ll find the most incredible collection of goods for sale – everything from stuffed toys to industrial scales. It’s totally hectic negotiating your way through the crowds and motorbikes laden with supplies, but that’s part of the fun. Not only is the variety of goods on offer fascinating, but the array of characters is just as interesting. After an hour or so of wandering and shopping we were parched and decided to sample the local Thai iced tea – a potent looking concoction that was surprisingly refreshing, despite being rather sweet. Whilst I resisted the urge to purchase stuffed tigers in 5 different sizes, my friend picked up sets of super hero clothing for his nieces and nephews (as I looked on with envy, wishing they had my size). We continued to wander the market, tasting various delicacies from vendors who lined the streets. Terrified of catching a stomach bug, we only chose vendors who had a healthy supply of local customers (an indication they have a good reputation for clean food). Once evening fell we headed straight for the famous seafood restaurants which suddenly appear on street corners every evening. Perched on our plastic chairs and huddling around a small table, we gorged ourselves on curried crab and dumplings at the famous T&K seafood (49 Phadung Dao road – look for the green shirts) – a great Chinatown eating experience. Not for the faint of heart or weak of will, Chinatown can test one’s resolve however rewards with an immersive an intense sensory experience. And who doesn’t like those? Enjoy your time in Chinatown Bangkok.